26 MMS January 2017 mmsonline.com RAPID TRAVERSE Machining Technology in Brief T he promise of additive manufacturing will be found in products that are designed to be made this way—that is, products that take full advantage of the geometric freedom that can be realized through 3D printing. A recent successful example of this relates to milling cutters. Komet's "Revolution" line of milling tools includes tool bodies made through metal additive manufactur- ing to realize design features including a flute density higher than what is practical to achieve on conventionally manufactured tools. When it comes to cutting edges made of PCD (polycrys- talline diamond) that hold the potential for more aggressive milling, adding more flutes to the tool directly enables faster feed rates. Thus, Komet is actually using additive manufacturing to make subtractive manufacturing more productive. C o m p a n y D i r e c to r o f P r o d u c t i o n C u l l e n Morrison sees making tool bodies through 3D printing as being the way of the future, at least for PCD. This cutting tool material often can take advantage of all the flutes it can get, he says. 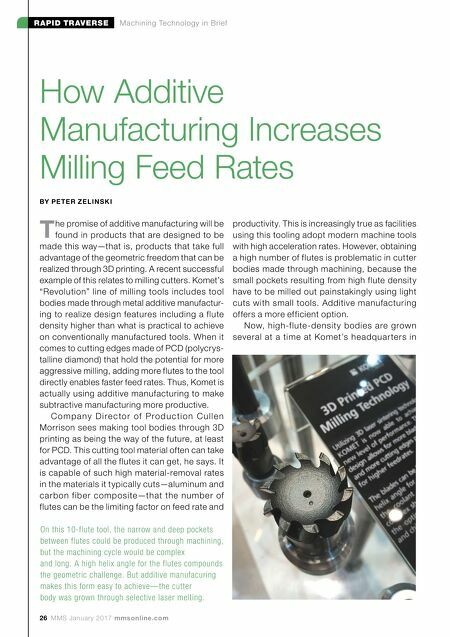 It is capable of such high material-removal rates in the materials it typically cuts—aluminum and carbon f iber composite—that the number of flutes can be the limiting factor on feed rate and How Additive Manufacturing Increases Milling Feed Rates BY PE TE R Z E LI N S K I productivity. 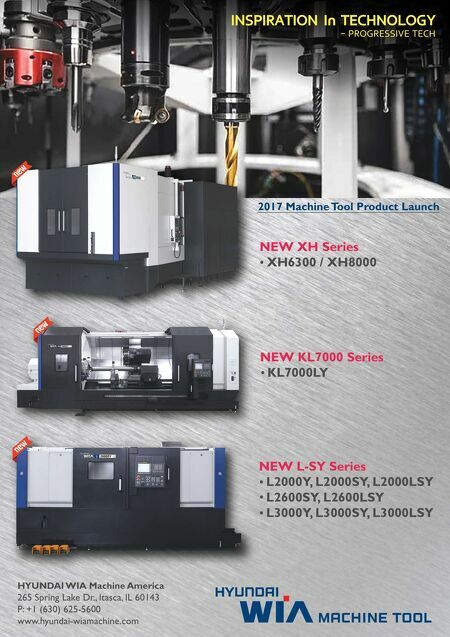 This is increasingly true as facilities using this tooling adopt modern machine tools with high acceleration rates. However, obtaining a high number of flutes is problematic in cutter bodies made through machining, because the small pockets resulting from high flute density have to be milled out painstakingly using light cuts with small tools. Additive manufacturing offers a more efficient option. Now, high-flute-densit y bodies are grown several at a time at Komet's headquar ters in On this 10-flute tool, the narrow and deep pockets between flutes could be produced through machining, but the machining cycle would be complex and long. A high helix angle for the flutes compounds the geometric challenge. But additive manufacuring makes this form easy to achieve—the cutter body was grown through selective laser melting.